Great job so far. I'm following with interest because the same baby is in my to-do list. 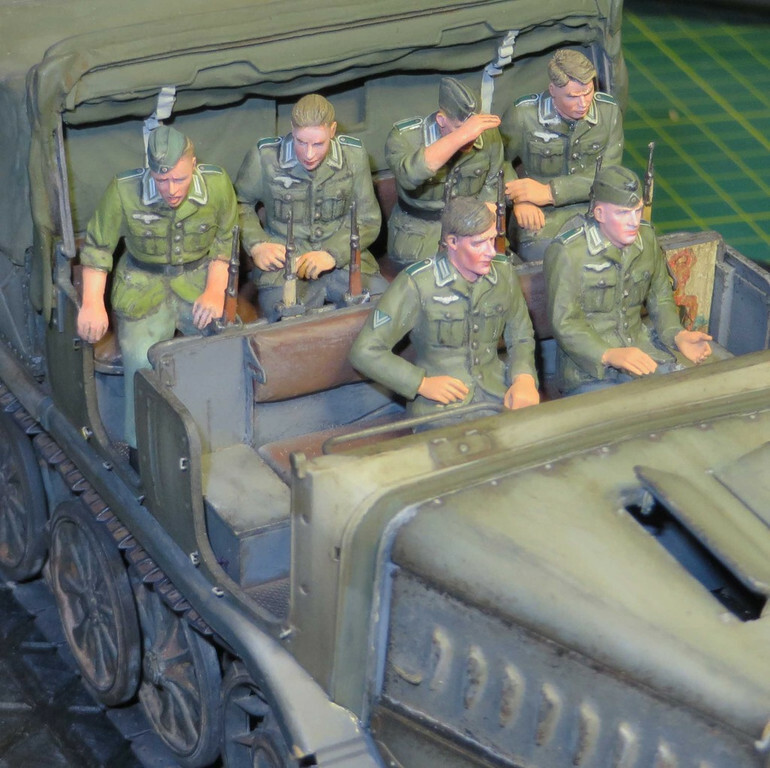 Unfortunately it is a slow and methodical task getting the figures, Famo and trailer done. Near 2 years and a lot of patience . Here is the next figure to be painted. 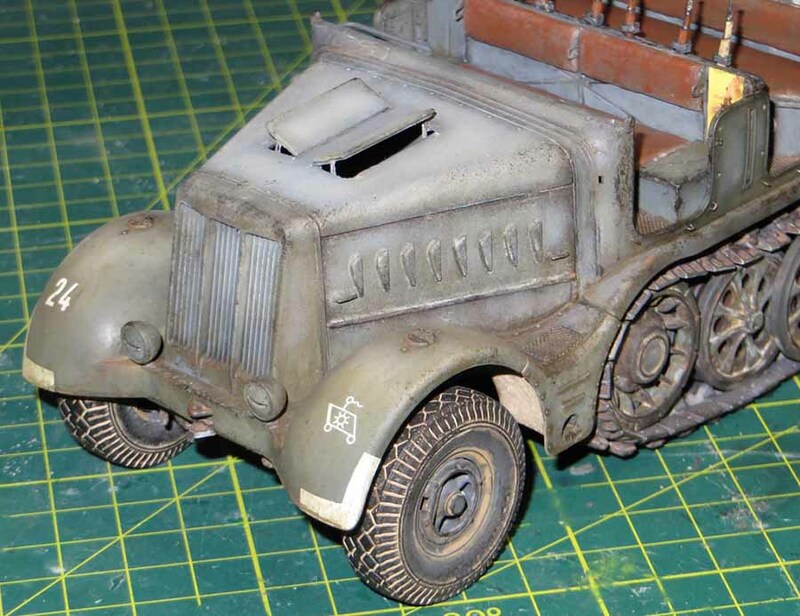 There was a delay as I had been working on Ammo washes on the various panels on the front of the Famo tractor. Here is the side panel with a Ammo wash to darken the panel to try and create a realism effect. The figure in the image is the next one to be painted in enamel paints with oil paints for the arms and face . 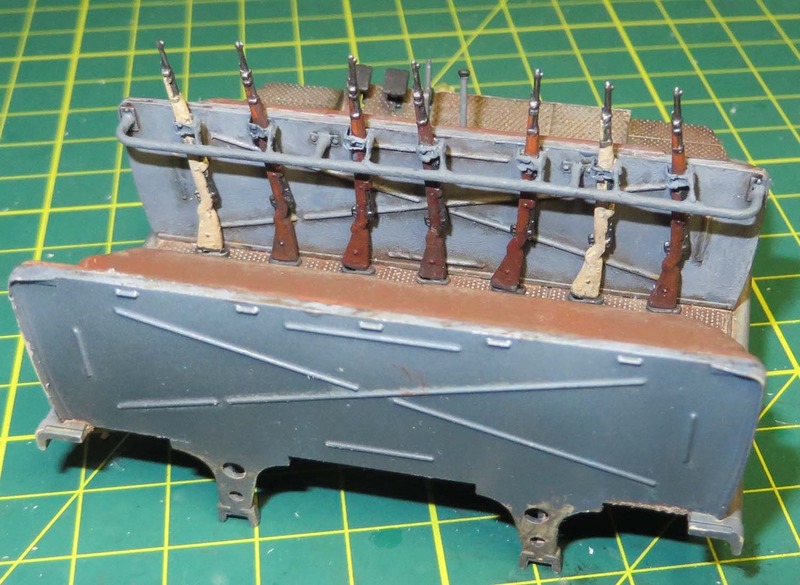 The figures in the front compartment will be a combination of Vallejo acrylic ,Humbrol enamels and Andrea acrylic paints.This will be to break up the uniformity of no 2 figures being identical . More to follow on the figure. Here is the kit figure glued together with Tamiya thin and thick glues , the glue is perfect for figures because it welds the plastic components together and there is very little need for filler . Was a big fan of Revell glue until a few years back and I never look back at using the Tamiya glue . The upper torso is dremmelled out to allow the hornet head to sit within the Torso . The figure is then airbrushed in Mig's ammo primer . Was a Humbrol primer fan for many years although the Ammo product is way quicker to use. A couple of drops of primer and a drop of thinner and bang away you go . The Ammo cleaner is the way to go for clean up of the primer after use. just like experimenting with new products . 226,31 and 147 for highlights. The head and arms have been painted in oil paints with a black pin wash for the fingers , eyes,mouth and ears . A black and grey pastel application was made for the bearded growth area . This was applied with a fine brush, hard to see in the photo's but it is there . 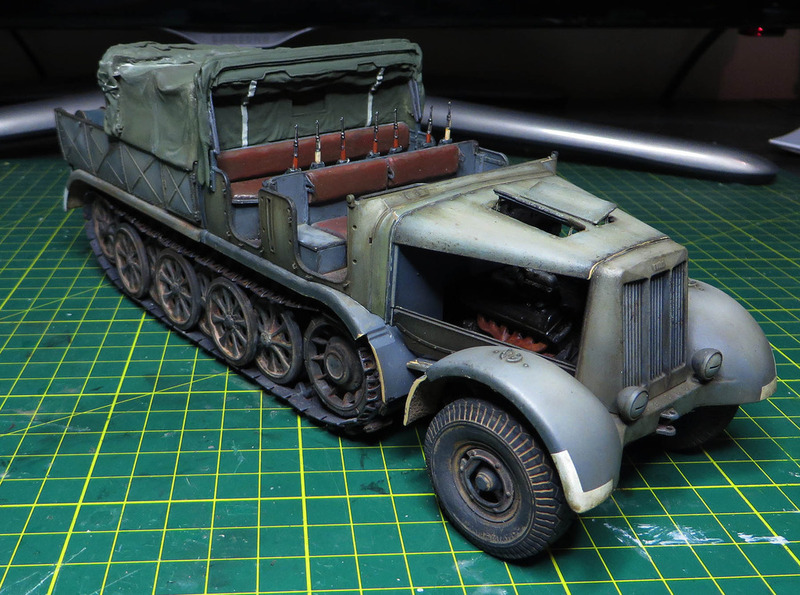 Tester Glosscote and dullcote had been used for the Tamiya decals for the cap, epaulettes , collars and belt buckle. 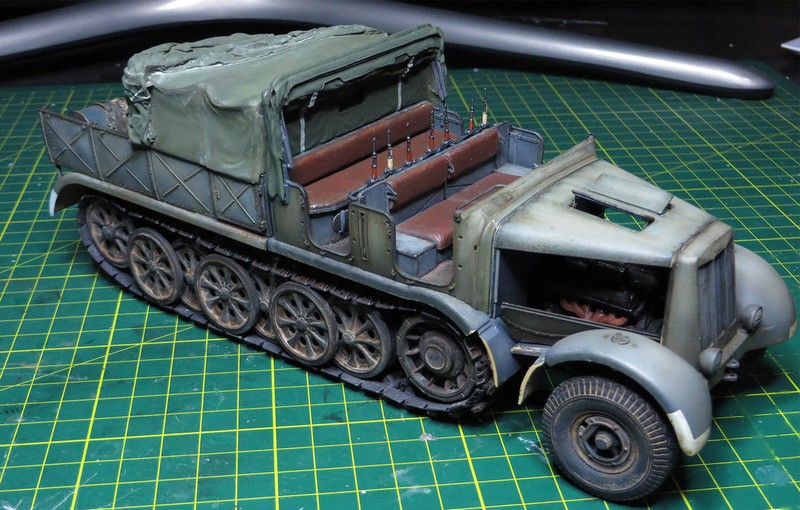 Glosscote applied and then set for a couple of hours , maybe a day or more and then the Tamiya decals applied with Mr Gunze mark softener . Once dry I applied a coat of Tester Dullcote to the cap and uniform only. I stayed clear of the skin areas because they hold the transparency with the oil paint. I'm building planes currently, but Dang! that looks good. Hi Michael - great build. 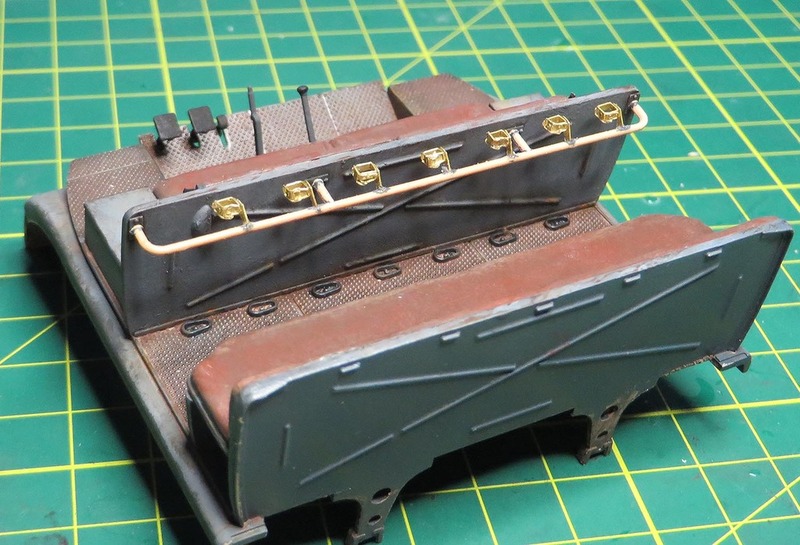 With the complexity of it, it looks like you're building several kits at once - nice! I must say, I like the painting technique you're using - like the image above, where you're testing the figure's fit. Fairly clean on the seats and body, but nice wear shown on the floor. Looking forward to more. More figure updates to follow shortly. With the example photo taken under a flouro light it has made the figure's uniform look a little brighter. Did not notice it as much until after posting . Looking good and coming along nicely. I will have to try the Tamiya glue as per your recommendation. The glue I am using doesn't bond very well. Pretty much a bad feature for glue I would think. Any plastic seems to bond from the Tamiya glues and I still use the Revell glue depending on the application . The Tamiya thin glue is highly recommended to be used with the Tamiya putty. Thin the putty down with a the Tamiya glue and use the finer brush to apply around the arms and legs to fill any cracks . Just a small update on the progress . Spent a few hows on the aber rifle racks today , still have to glue on the bolt heads at the base of the latch . Beautiful work Michael, the figures are very impressive. Your techniques are timeless. Had to spend some time to get the rifle rack together. There was no way I could close in the cab till I get this done . Rifles are done, a little more touch up painting and weathering and it's back to the figures. 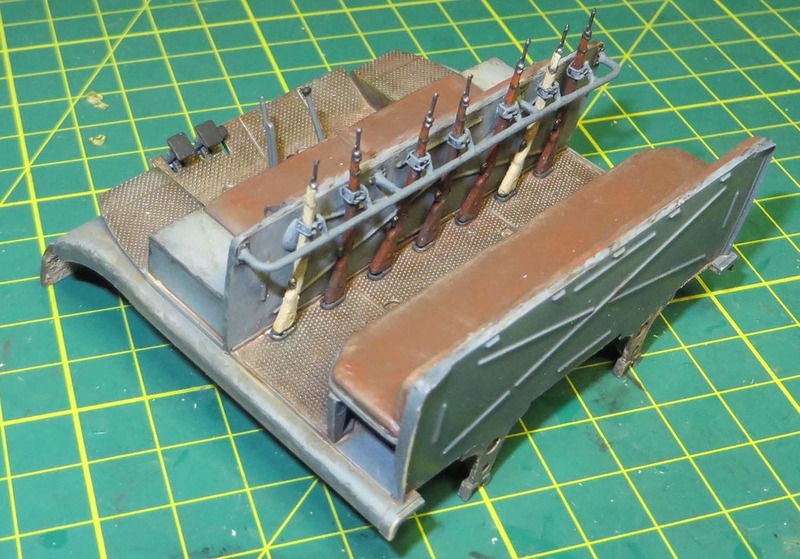 Test fitting Engine , troop and cargo compartments. The Beast comes together for the first time. Nice job on that figure Michael.The Famo and trailer(previous page)is superb too. If you are looking to ring the changes with the figures a bit, I think Tamiya made a mistake with their Famo crew. They seem to have confused the Reed Green Drill field uniform with the Denim fatigue suit. These were a cement coloured raw cotton drill outfit, much simpler in design without the chest pockets and no flaps to the skirt pockets. This suit was frequently worn by engineers and mechanics who were likely to be involved in dirty work to save their Feldbluse from damage. Overalls were popular with tank repair crews too, usually grey, although the SS had a camo version that was issued to tank crews. As the war went on the off white denims were often dyed a green grey colour for concealment. 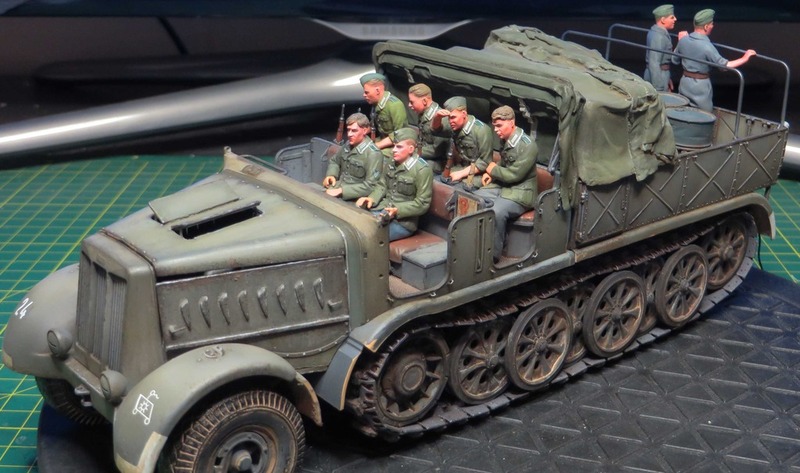 Both of these are easy to reproduce by careful carving of the Tamiya figures, or are available from the AM guys; in fact the standing guys in the kit are of course wearing overalls. Appreciate your words and the figure info. LOOKIN' GOOD, Michael. That TAMIYA FAMO & Sd.Anh.116 is one sweet kit! I see that we follow the same techniques and coloring! I did something very remarkably similar as you are doing; I spent a fortune on ABER PE and resin stowage and updates from other manufacturers for both the Tractor and the Trailer. I replaced the Wheel/Tire assemblies with resin ones, and I used Friulismo Tracks for the Tractor. I loaded the trailer with DRAGON's Excellent #6713 s.IG.33 auf Fgst. Pz.Kpfw.III (Sfl. ), which I enhanced with VOYAGER PE, and Friulismo Tracks. The FAMO is shot in overall PANZERGRAU with a thinly sprayed "squiggle" camo pattern of a color close to "AFRIKA GRUNBRAUN". The trailer is in overall PANZERGRAU, as is the s.IG.33/Pz.III. I had the early stages of Stalingrad in mind for this project. Yes, then you know how difficult it is to stay committed on a large model. With all the new models being released it's hard to keep on this tractor and trailer. It was around this time 2 years ago when I was posting the plastic sprues. The end is close. Received confirmation the transport box for the Famo is ready for pickup this week. Will post some photo's as soon as it's received. The famo crew have been painted in Vallejo acrylics with oil paints used for the face and hands. The figures are now in the next stage of having the decal collar tabs and shoulder boards applied.A coat of Testers gloss coat has been used to help sit the decals on the figure. Once the decals are done the next stage is to glue resin hands to the remaining 3 crew figures. Engine side covers have been detailed and are ready to be glued into position. The front and sides of the crew compartment has been glued together. 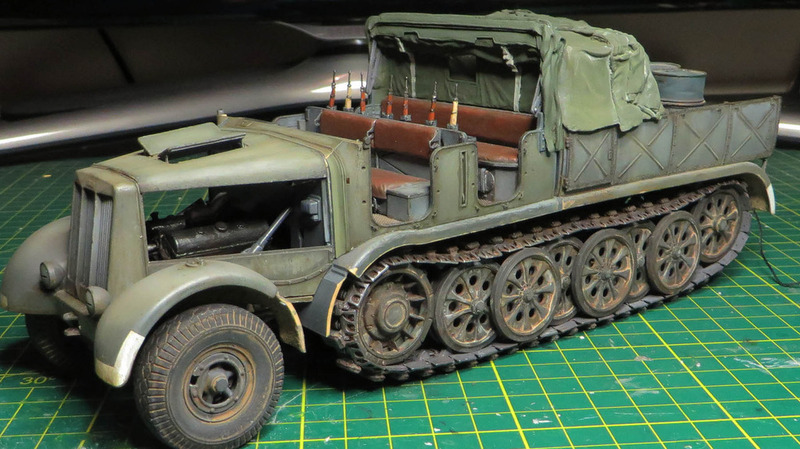 Further work will be required to place the crew figures and equipment in the cab and will be glued to the chassis at a later stage. Great looking Famo and figures Michael. Cant wait to see the trailer come to life. Keep up the good work. I am looking forward to your next update.